How to coexist with coyotes is always a controversial subject in Los Angeles. Some residents want them extirpated by any means possible, while others, like myself, believe that we should learn to “live harmoniously” with the critters that were here many years before us. Luckily for people like me, current city policy does not allow trapping, and mandates educating the public on ways to coexist with local coyotes. To further this goal, Los Angeles Animal Services has been promoting local neighborhood meetings to teach Angelenos how to “haze” coyotes. “Hazing” is a relatively new method to scare away coyotes that you encounter when you are outside, and is used to prevent them from becoming habituated to humans. On Thursday, January 19, 2017 at the Griffith Park Visitor Center Auditorium, Franklin Hills Residents Association (FHRA), Los Feliz Improvement Association (LFIA), The Oaks Homeowners Association, and Friends of Griffith Park (FoGP) sponsored a joint meeting to teach members and neighborhood residents how to “haze” coyotes. 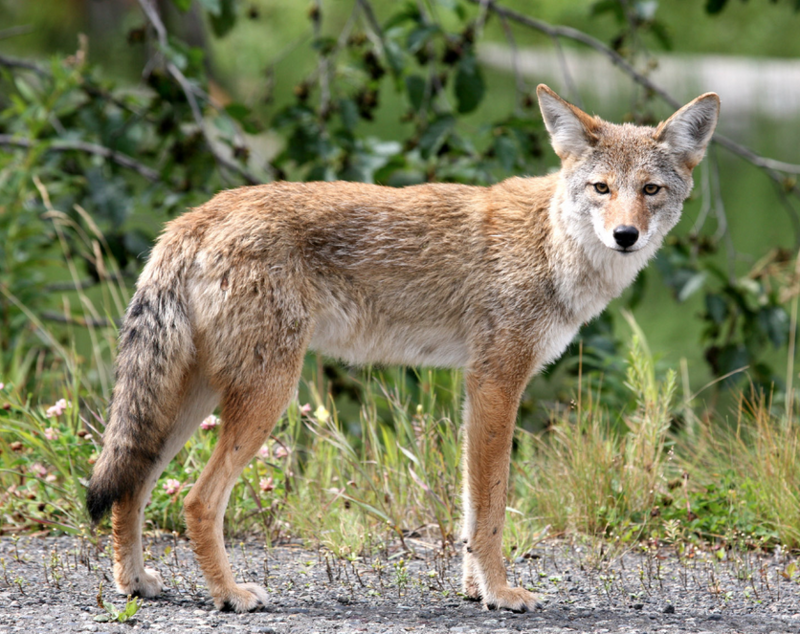 The meeting was conducted by Cathy Schoonmaker and Justin Brown from the National Park Service, who are currently heading up a study of urban coyotes in Los Angeles. Nyla Arslanian, President of LFIA hosted the event. Shirley Mims from FHRA spearheaded the refreshments, and FoGP President Gerry Hans, Board member Kathryn Louyse, and I, helped with organizing and promoting the event. Brochures were supplied by Project Coyote and other local organizations. 100 free coyote deterrent whistles were also available for attendees – all gone by the end of the evening. L.A. Animal Services Wildlife Officer Hoang Dinh opened the program, and described the City’s policy and role in local wildlife control. Officer Dinh has a particularly difficult job, since he is the only Wildlife Officer in the City. Next, Cathy and Justin discussed local coyote behavior and how to cope with any you might encounter. They described both “passive” repellent techniques – such as fences, removal of food sources, and motion activated devices; and “active” repellent techniques including “hazing”. After a coyote hazing video was shown, Cathy and Justin demonstrated various methods and devices to haze coyotes. They advised attendees to always carry deterrent devices when they walk, bicycle, or hike in the area. Devices shown/demonstrated included objects to throw, air horns, coyote rattles, umbrellas, and whistles. After the presentation, there was an extensive question and answer session that lasted until everyone had been recognized. It is important that we all learn to live with coyotes. They are going to be here for a very long time. If you weren’t able to attend, and would like to learn how to “haze” coyotes, a video of the meeting is posted here Coyote Hazing. YouTube also has other videos that you can watch by searching for “coyote hazing”. Previous ArticleVolunteers for 2017 Raptor Survey is NOW FULL!